Vartiokyla the site of an 11th century fortress, which gave the district its name. It has two beaches and around 277 hectares of parks and forest areas. This is a middle- to lower-middle class district. In the 1930s, Helsinki workers (mostly road laborers) set up homes for themselves in Vartiokyla, in the area known as Vartioharju. Later these were mostly replaced by closely-packed blocks of flats. There are also terraced and semi-detached housing in the area. In the 1960s, apartment blocks went up in the Puotila area. Most of these surround a common yard. Another suburb of concrete tower blocks formed in Puotinharju at around the same time. 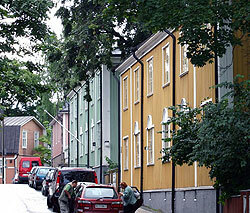 A number of villas were built during the 1920s in Marjaniemi, but most of are gone today, replaced by newer housing. And nearby Itakeskus is known for its mall of the same name the biggest indoor shopping centre in the Nordic countries. The mall is right next to the metro station, which opened in Vartiokyla in 1998, leading to a lot of new residential and office construction nearby. Myllypuro is a forested area that was converted into a modern suburb of concrete tower blocks in the 1960s. It remains a fairly rugged district, marked by a rocky, tree-covered landscape. The district's concrete flats rise in between richly forested tracts. In the 1990s, Myllypuro began to attract many expat residents. This may have been what led to new construction here, creating the Hallainvuorentie residential area. Situated on the western part of Myllypuro, Hallainvuorentie is dominated by a different design aesthetic. Its houses are smaller and more densely constructed. More residential and commercial development is planned for the Alakiventie area, the south and east-central areas of Myllypuro, and the area in the vicinity of the Myllypuro metro station. The Myllypuro Sports Park, has skating and hockey rinks and football fields. It occupies the southern part of the district (Etela-Myllypuro) not far from an outdoor recreational area with hiking and biking trails that are used for skiing in the winter. In Mellunkyla, during the 1960s, the massive Kontula housing estate was rapidly constructed within a few years. With enough housing for more than 20,000 residents, Kontula was for a long time the most populated suburb in Finland. But its large, rectangular tower blocks were largely remote from commercial services, until in 1967 a shopping mall opened here. Called Kontulan ostoskeskus, it is the third-largest shopping centre in Helsinki. There are several smaller neighbourhoods in Mellunkyla. In the 1980s, Kurkimaki was built to add onto and complement the older suburb. It is much smaller, however, housing only about 2,700 inhabitants. Vesala is composed of a mixture of detached houses dating to the 1950s, and blocks of flats built in the '80s. Mellunmaki has residences that were built in the 1970s, most of them prefabricated low-rise buildings. In the 1990s, a residential development for 5,000 inhabitants arose in Kivikko, right next to the large recreational park there. Commercial and office buildings soon followed; many of these are still undergoing construction. Mellunkyla's population is largely composed of working-class families, including a large number of families with children. It also has a higher than average immigrant population. Vuosaari is the biggest district in Helsinki in terms of land area. It is also the fastest-growing district in Helsinki today, and is well on its way to being a mini-city within the larger city. Vuosaari has a population of around 35,000 inhabitants at present, and it is projected to have 40,000 inhabitants by 2010. Fortunately, Vuosaari has a lot of space, and includes sprawling forest lands and a long and largely unspoiled shoreline. Its unique protected nature areas include Mustavuori (Black Mountain), Kallahdenniemi (Cape Kallahti), and Porvarinlahti, a marshy bay rich in birdlife. Vuosaari has long been a major recreational getaway area for Helsinki residents. The Rastila camping ground is found here. Recreational beaches are located at Rastila, Kallahti, Kallahdenniemi, Uutela, and Aurinkolahti. Vuosaari's population boom was triggered during the 1990s, when the district became a focus for residential development. The Meri-Rastila and Kallahti housing estates were built then. In the early 2000s, high-rise apartment buildings went up in Aurinkolahti, Rastilankallio, and the Vuosaari town centre. Meanwhile, the Ramsinranta and Keski-Vuosaari areas were devoted to smaller-scaled, family-oriented housing developments. One thing most of these housing areas have in common is an attractive seaside location. Vuosaari has also acquired a major seaport, Vuosaari Harbour, which just started operating in 2008. Some of the operations of the Helsinki Port have been moved to the harbour. Alongside it is a 75-hectare business park.